Offering Pan Asian cuisine served in a spiritual setting, Shinsei (Japanese for “new beginning”) boasts a wide variety of gourmet sushi and tantalizing traditional Japanese entrées all prepared by the “King of Wok” Shuji Sugawara. A favorite of diners are Shinsei’s signature Poppers, which make for an excellent bar snack or appetizer. Enjoy an impressive list of wines, sakes, and nightcaps while immersed in a hip yet relaxing environment decorated with art from co-owner Tracy Rathbun’s own art collection. Whether you’re looking for a night out with the kids, friends, or that special someone, Shinsei Restaurant aims to accommodate any need with a ying-yang balance of casual dining and far eastern flair. 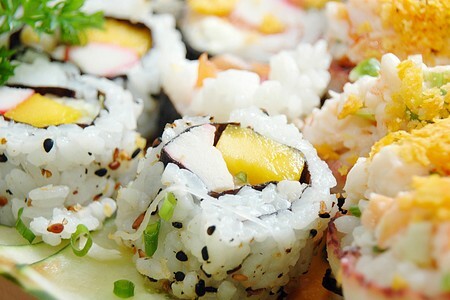 | Lunch 11 a.m. - 2 p.m.
Do you have a gluten-free sushi menu at Shinsei? There is no gluten free menu. However, the Server will assist you in placing an order for gluten-free items.